A friend and I recently talked about beginning a new patchwork group for Mums at our local school who may be in need of a creative outlet and some new friendships. So to start the group off, we thought we'd begin with a sampler - not an original idea, but a great way to teach new skills for people. Of course we needed to choose the blocks and write some instructions - that fell to me. So here is the flimsy of the sampler. I decided to do it in quite strongly contrasting colours so that things would stand out obviously for people. I thought I'd also use it as an excuse to plan for a baby quilt - we have a number of those expected in our community. I enjoyed the process, found it a challenge to make sure that I had all the measurements correct so that we would create raw 12 1/2" blocks, then add sashing. Anyway quite happy with the use of the fat quarter of owls as my feature print - that worked well. We had our first class, beginning with a rail fence block, on Friday just gone. It was wonderful to see people grasping the joy of putting fabrics together. I didn't realise how much skills that I use almost daily, including using a cutter and ruler, can take a little while to grasp. The newcomers gradually got the hang of it though and so begins the wonderful adventure and journey! This isn't one of my current working list (eight works in progress) but I have made some progress on one I hope to share later this week so I am making some gradual progress and I'm happy with that. 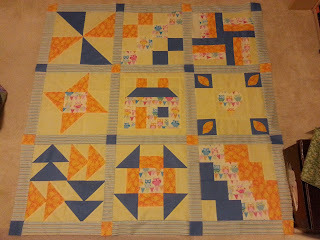 Linking up with Val's Quilting studio and other Linky parties. Visiting from Vals, great color choices. I remember being one of those newbies and all the tools were so new...it's wonderful you are so patient and understanding. THIS was a great beginner sampler for so many. Thanks for sharing it under our sampler theme this week!